Brookhouse may be the most expensive private school in Kenya. But it’s also one that has a tremendous appreciation for art and for teaching students to discover their creative capacity through art. The best evidence of the value the school places on art education was apparent last weekend (June 15th and 16th) when the art departments of both Brookhouse schools organized a students’ Art Exhibition at Village Market right next to the main entrance. None of the artworks were for sale. “That was the arrangement we made with the management,” explains Lindy Nyaseme, the Head art teacher at Brookhouse’s main campus in Karen. But that issue didn’t bother these young artists, some as young as five, others as old as 17. They are just pleased to have their artworks selected to be in the exhibition and to be having the first public display of their art. Among the artworks exhibited were paintings, prints, photographs and one sculpture that looked it might have been inspired by either Leonardo Di Vinci or Alberto Giacometti or both. What’s most appealing to me about the Brookhouse approach is that unlike the Kenyan system which functions of the facile position that art isn’t important, this school finds art to be integral to a child’s early education. “From pre-primary all the way up, we teach every [grade level] student art twice a week, and for one hour every session,” says Lisa Bagot, an art teacher at the original Brookhouse campus in Karen. Then she adds that children can also major in it for their A-level equivalent, and even two years before that begins, they can focus on it. Then too there’s another A level equivalent called BTEC which also has a fulltime focus on fine and applied art. What was exciting to see in the various displays of the children’s artworks was discovering how proficient and passionate about art that they all seem to be. Some of the most sophisticated works that I saw were photo-shopped images by students like Roland Tegwa and Mehdi Nanji. Both created works that were highly original and startling to the eye. Mehdi had created a lovely woman whose hair literally ‘stood on end’ even as it looked spiked like a funky musician or a mad woman. Meanwhile, Ronald’s imaginative image sends out an apparent message -- that man might be more animal than human. We know of course that man is both animal and human in the best sense of the term. What isn’t immediately clear is that the animal photo-shopped is a panda. “The hardest job was assembling the [partial] images to blend them together in a way that was also balanced,” says Roland, who at 17 has just completed his A-levels and wants to return to Brookhouse to take the BTEC course for an extra year, eventually to become either a graphic or an interior designer. One hardly doubts that he’ll achieve his dreams, especially with teachers like his who are fully invested in seeing him succeed. 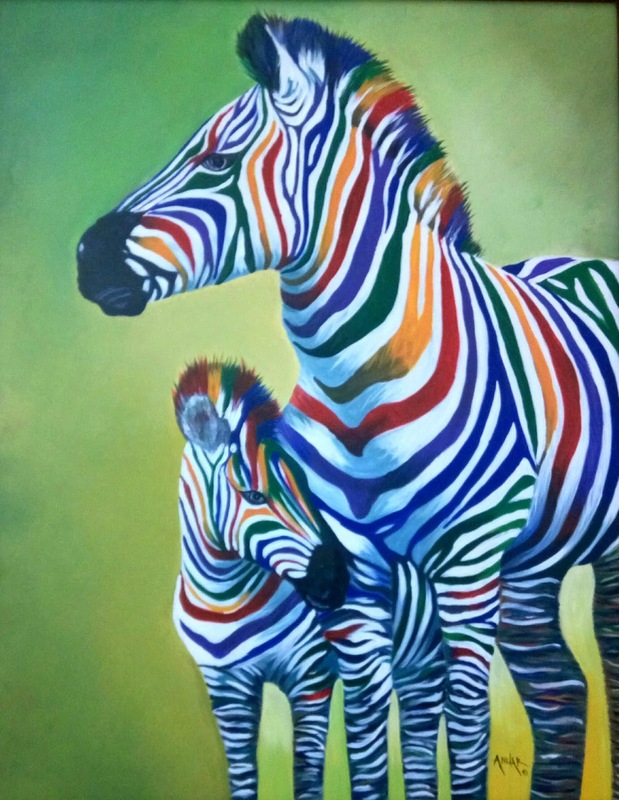 What was most impressive about the Brookhouse show is not just the quality of the works, including that five-year-old’s colorful and well-proportioned painting. It’s also the teachers’ understanding that the work they do, promoting creativity as a way of thinking, being and doing, is critical to shaping their students’ futures. One only wishes that school curriculum developers in Kenya would have a similar commitment to including art as an examinable subject in the national syllabus in a way that’s similar to what transpires at Brookhouse. For one doesn’t have to be rich to include teaching art in the classroom. Especially when so many active Kenyan artists are currently focused on using local materials and found objects to create fascinating works of art. The contrast between Brookhouse’s innovative approach to teaching art and Kenya’s antiseptic approach to cutting out art education entirely is stunning and very sad. There’s been a longstanding debate about the need to ‘decolonize’ Kenyans’ minds when it comes to many sphere of thought. But the debate has yet to heat up related to the crying need to decolonize curriculum developers’ minds about the value of creativity and the virtue of teaching art in Kenyan schools. Up to now, the most convincing argument put forward by Kenyan educationists in favor of promoting creativity in education is economic. But creativity in itself needs to be seen as the key to innovation, the attribute everyone says is what will leapfrog Kenya into a productive future. With Circle Art Gallery’s mounting of its ‘Vanguard I’ exhibition, Danda Jaroljmek has assembled a wide range of wonderful Kenyan artists who were active ‘in the 1980s and 1990s’. And by so doing she has formally debunked the false notion that Kenyan contemporary art only kicked off the other day or only in the 21st century as some recent observers to the Kenyan scene speculate. What’s also true is that quite a number of the 26 exhibiting artists at Circle were active, not just in the 80s, when the late Ruth Schaffner arrived in Nairobi from Los Angeles and bought Gallery Watatu from Yony Waite (whose art is part of ‘Vanguard 1’ along with that of another Watatu cofounder, the late Robin Anderson) in 1985. Many in the Circle show were busy working artists much earlier than the 80s. Indeed, Yony and Robin with David Hart established Watatu in 1969 and were busy throughout the 70s. Elimo Njau together with friends like Pheroze Nowrojee, Terry Hirst, and others started Paa ya Paa in 1965. And that is where the great Kenyan sculptor, the late Samwel Wanjau got to work sculpting the awesome Mau Mau Freedom Fighter (which was downed recently by dark unnamable forces and is now in need of urgent repair). Wanjau worked at PYP in the 1960s. In fact, one of the most stunning (and precious) works in the entire Vanguard show is Samwel Wanjau’s seven foot tall wooden ‘Mwoboko’ sculpture, mwoboko being the name of the Kikuyu dance this finely-carved couple are poised to begin. Ancent Soi, Jak Katarikawe and even Theresa Musoke (all in Vanguard 1) were also exhibiting at Watatu in the 70s. And Yony Waite was already good friends with Sane Wadu during those ‘early’ days. Ancent Soi (yes, father of Michael) was already hosting his own solo ‘exhibitions’ inside the Nairobi City Market where his stall was originally booked to sell fruits and vegetables but it became a popular showcase for his art. It was from there that the elder Soi got wind of the Olympic ’72 poster art competition, which he won and which earned him a trip to Munich to pick his Olympic prize. Theresa Musoke, the one award-winning Ugandan artist in ‘Vanguard 1’ was also exhibiting at Watatu in the 70s. She’d studied overseas but couldn’t return to her homeland as it was still being marauded by barbarians like Idi Amin and Milton Obote. Even the one South African artist in Vanguard 1, Charles Sekano, was exhibiting his original wax crayon drawings in the 1970s when it was Goethe Institute that gave him his first solo show. He was a refugee from the Apartheid regime at the time and claimed he’d taught himself to be an artist by sitting in local libraries for hours, studying books on fine art. In short, one wonders why Circle didn’t stretch the description of the period being revisited as that of the 70s as well as 80s and 90s. It’s true that the majority of the 26 derive from the 80s, including Annabel Wanjiku, Meek Gichugu, Kivutha Mbuno and Zachariah Mbuno (father of artists Kamicha and Njuguna) as well as Shine and Rahab Tani and a whole slew of Ngecha artists like King Dodge Kingoroti, Wanyu Brush, Sane and Eunice Wadu (all of whom are currently on display at Nairobi National Museum as members of Ngecha Art Centre). But as laudable as Vanguard 1 is, it might inadvertently mislead the public into believing Kenyan contemporary art only took off in the 80s, which is clearly debatable. Even Wanyu Brush got serious about painting in the late Sixties when he joined YMCA’s Craft Training Centre. Francis Kahuri also kicked off his art career in the ‘70s after studying at the little-known Kenya Art Society. And of course, our ‘cucu’ of contemporary Kenyan art, Rosemary Karuga, the first Kenyan woman to get a degree from Makerere University in fine art, was painting from the Fifties. The point is the Kenyan art scene was well on its way some decades before the 1980s. Nonetheless, a brilliant art marketer like Ruth Schaffner made it her commercial ambition to make Kenyan artists renowned not just in Kenya but in places like Frankfurt and LA. She did a pretty good job of it. But I’d say Circle Art is doing even better by bringing together so-called ‘second generation’ artists like Sane, Meek and Annabel with authentic pioneers like Ancent Soi, Samwel Wanjau, Rosemary Karuga and even Yony Waite; then placing them all in the ‘vanguard’. Bankslave (aka Brian Esendi) is best known in Kenya for being one of our leading graffiti artists. He’s a man who’s mainly made his mark artistically, not for art exhibitions held in local galleries, but for his fabulous designs spray-painted on walls all around the city, coast and countryside. Probably his best known work is his portrait of Lupita N’yong’o painted at the GoDown Art Centre. It’s been a source of inspiration to many up-and-coming Kenyan artists. It’s also become emblematic of Kenya’s booming graffiti art scene. But Bankslave also gets called to do special projects for private clients, the latest one being the new Hilton Garden Inn on Mombasa Road, just next to Jomo Kenyatta Airport. What the Inn’s owner, Ashak Manji had in mind, says the artist, is for him to paint, not graffiti designs, but imagery reflective of what visitors to Kenya might see if they had the time to do short or lengthy tours of the town and country. Essentially given free-reign to fill two massive walls in the hotel lobby with paintings meant to appeal as well as highlight the country’s cultural and natural assets, Bankslave has made beautiful murals that grab your gaze the moment you walk in the front door of the Garden Inn. “One’s a cityscape of Nairobi that includes the tip of the National Park,” says the artist who also included an aircraft flying overhead together with the face of a lovely Kenyan woman in the mural that also seems to fly overhead the lobby’s spacious foyer. “The murals look especially good in the evening when the lighting enhances their beauty,” says Lorenzo Baleri, the hotel’s General Manager. The other lobby mural covers the wall on your left as you enter the Inn, the first of this Hilton franchise in sub-Saharan Africa (the first one in Africa being in Morocco), is a colorful profile of a giraffe and young woman meant to symbolize the natural beauty of Kenya. But those are not the only walls Mr Manji wanted Bankslave to fill. “One’s in the basement that visitors see once they leave the parking area and enter the hotel,” says Liz Tapawa, the Inn’s Sales and Marketing Director. “The other’s on the sixth floor outside the In-house visitors’ lounge,” she adds. The basement mural is of a young, grinning Maasai moran who’s bedecked with beaded head and neck gear fit for a Hollywood photo shoot. And the last wall is incomplete, containing only one lonely leopard which Bankslave painted next to a window that sadly had been left ajar just before a heavy rain storm that damaged to the wall which was meant to be covered with a vast wildlife scene. Hopefully, Bankslave will get back to that wall and complete the project since his Hilton Garden Inn work clearly confirms that he’s tremendously versatile artistically. He’s masterful graffiti artist, but also has the capacity to work in a variety of artistic styles and genres. What the project also confirms is that local and international hotels are increasingly seeing the wisdom of working with local artists to enhance the beauty and interest in their interiors by having the artists paint imagery from their everyday lives. We’re seeing something of a trend when in additional to the Hilton Garden Inn inviting Bankslave to cover its walls with original art, the Hotel Intercontinental (Nairobi) also recently announced its support of local artists, exhibiting works first by Ruth Nyankundi and currently, by Dinesh Revankar. We’ve also seen the Dusit D2 Hotel hosting monthly art exhibitions for up-and-coming East African artists. And we occasionally see the Villa Rosa Kempinski hosting artists’ workshops and shows like the one they held late last year with the GTB (Nigerian) Bank. Kempinski’s Ballroom was filled with works by a dozen outstanding Kenyan artists. And even the Fairmont Norfolk Hotel recently had a solo exhibition right in its lobby featuring the art of the young Kenyan painter, Coster Ojwang. What’s more, it was just a month ago when the Sarova Stanley Hotel had an ‘Art Festival’ curated by Lisa Christoffersen and displaying works by everyone from Mary Collis, David Marrion and Anthony Russell to three young artists from the Kibera Art Centre. So it’s no surprise that Bankslave is now part of a burgeoning movement wherein the corporate sector is seeing the wisdom of supporting contemporary Kenyan art. Suicide and grief tend to go hand in hand. Both are mental health issues that are not only affecting Westerners like the fashion designer Kate Spade and the celebrity chef, Anthony Bourdain. They are increasingly affecting Kenyan homes, touching the lives of both young and old. Jenetta Barry found a way to deal with the grief that nearly overwhelmed her soul after she lost her daughter Jen to suicide. But Ms Barry is blessed with an artistic spirit and she’s not only evolved something she calls the ‘Epiphany Process’, which is essentially a technique for coping with and overcoming grief and depression. She’s also written books to help her come to terms with Jen’s fateful choice. But possibly the most exciting, instructive and inspiring thing Ms Barry has done since Jen took that extreme turn is to create a musical production infused with contemporary dance. ‘Ins;ght: Beyond the Edge’ could easily be called a contemporary ballet, not so much a musical. Either way, it opens 23rd June and runs for two nights at Kenya National Theatre. It’s bound to speak to a broad population, whether one’s contemplated suicide in any form, or not. Ms Barry has been a professional dancer in a past life. But even with that artistic background, it took her some time to realize one of the best ways to recover from grief is to translate all that negative energy into a positive theatrical production meant to send a message of hope ‘beyond the edge’ of that dark, deathly path. Devising the show from scratch over the past year, she has been working closely with Arnie Umayam, a professional choreographer from the Philippines. Arnie came all that way just to help her fulfill her dream which is to create a production that can artfully blend music (especially contemporary tunes that Jen had loved), modern dance and the spoken word, both as poetry and prose to help others understand that life is a far better option than suicide. The ultimate beauty of ‘Ins;ght: Beyond the Edge’ results from Ms Barry’s unique style combining honesty and artistry. She lays bare her whole soul in order for us to feel the depth and breadth of emotions that she and probably every parent who’s lost a child to suicide must have felt. As a consequence, the show itself is likely to provide audiences with their own epiphany experience. Of all places, McMillan Library was the site for high drama last Thursday night. It was a mix of comedy, satire and song blended with a healthy infusion of participatory theatre. There was one other essential element to the night, which had been choreographed by the Book Bunk, the NGO recently founded by Angela Wachuka and Shiro Koinange to renovate and refurbish the colonial vestige called McMillan Library. That element was the data these two illustrious women had to collect just to begin planning the process of renovation. Both Wachuka and Shiro have been book lovers from early on. But it was a stroke of mad genius for them to come up with the idea of rejuvenating one of Nairobi’s oldest and best-constructed bluestone buildings, including its two library extensions, one in Kaloleni the other in Makadara. Lighting up the pillared and ‘lionized’ front entrance of the Library with an alternating purple and green glow, the Book Bunk team escorted guests all around McMillan’s interior which was still stacked with piles of papers, dusty folders and old books few of which were by African writers. The shortage of African lit in the library was fully explained when Bryan Ngartia and Eddie Kagure of the theatrical team, ‘Too Early for Birds’, gave a rousing rendition of McMillan Library history, curated by Story Zetu. It had been built in memory of Sir William Northrup McMillan by his widow back in 1931, designed to cater for a strictly European readership. But to prove the Library’s worth saving, Wachuka and Shiro had to collect empirical data to illustrate that Kenyans currently use the three spaces in substantial numbers. Their data’s so impressive they managed to get Goethe Institute involved in the process, including sending McMillan’s Chief Librarian, Jacob Ananda, to study the library system in Germany. Eric Wainaina also entertained a library-full of guests with songs from his forthcoming album, ‘Dreams in Stereo’, after which Sheba Hirst introduced members of the Library staff as well as senior members of Nairobi County government. The County folk had been given a green light from Governor Sonko to sign on with the Book Bunk project. Meanwhile, Samosa Festival also had its drama last Sunday when Zahid Rajan invited Aleya Kassam to perform her sassy poem, ‘The 44th Tribe.’ (Aleya also performed last night with Sitawa Namwalie in ‘Love, Loss and Discovery’ which they co-wrote.) Aleya was part of the festival preview that will include an open-mic, films, fascinating forums, puppetry and flavorful theatre by Hearts of Art who will perform this Sunday in ‘All I ever Wanted’ at the Alchemist. 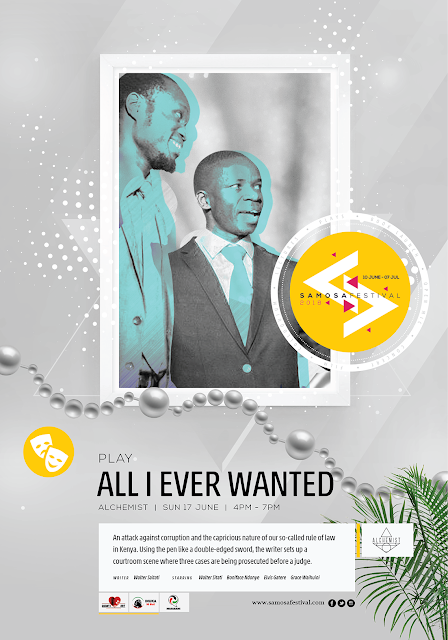 Last weekend, Hearts of Art performed another one of Walter Sitati’s plays. They’d staged ‘What Can’t Kill You’ at PAWA254 several weeks ago, but were called back by the public who’d heard about the writer’s salty satire. Sitati hits on everything from the media to the millennials to permissive, yet over-protective mum’s like the one played by Ellsey Adhiambo Okatch whose daughter, bratty Boitumelo (Abigail Were) grew up to be a thoughtless, adult brat (Pauline Kyalo). The one discerning insight the daughter has in the play is when she identifies her mother as the one who rendered her useless due to the mum’s lack of enforced discipline. For a writer who’s never worked in the media, Sitati has immense insight into how they operate. He also portrays the complicated relationship between parents and private school heads with acuity. Even his take on nepotism and the way it can kill an organization’s success is explored as both bosses (Ellsey and Walter) at the ‘Stinging Tongue’ magazine hire their relations to the detriment of the magazine. Finally, these past two nights at Braeburn Theatre, John Sibi Okumo again directed ‘Constellations’ costarring Silvia Cassini and Philip Coulson. My copy will go to press before I see the show again. But I know they had to bring back the play this week after seating got filled for all of last week’s shows. Word had gotten round that ‘Constellations’ is a show that not only sold out seats in London and New York. It’s also one of the most charming and enlightening scripts to be staged here in recent times. For it’s not often that theoretical physics, leave alone the science of beekeeping, are tantalizing topics found in the same story. Constellations is a sweet love story besides. Here’s hoping they stage ‘Constellations’ one more time. Paa ya Paa Art Centre has been hosting African and international artists ever since it opened back in 1965. The Centre has been organizing workshops and artist residencies as well as mounting exhibitions for them. In the course of all those years, many artists have left behind works which they either meant for the gallery to keep. Or they simply left town before they could give a second thought to collecting their art. “We’ve often invited artists to come collect their work,” says Phillda Njau, co-curator at Paa ya Paa with her spouse, the acclaimed East African artist Elimo Njau, who’s also one of the cofounders of the Centre. “When they haven’t come to pick their art, we’ve kept it in storage. But we recently had help to sort and catalogue those works from several student interns,” Phillda adds. That is how Paa ya Paa is now prepared to hold its first Silent Auction, filled with all the paintings left behind over the decades. “We haven’t set a deadline date for the Silent Auction as yet, but we’ve just put up all the artworks on our Facebook page for people to see,” says Phillda. The bidding process has already begun and the actual results of the Auction will be announced at Paa ya Paa, probably sometime in July. At that time, the public will be invited to have one last chance to bid on their favorite artwork, after which people will be able to take their winning bids home. “The artists may also come and claim their share of the sale of their art,” adds Phillda who says she welcomes the artists back to Paa ya Paa. One of the most intriguing aspects of the auction is that much of the art is by artists who were just starting out in their careers when they arrived at Paa ya Paa. Some came and stayed at the Centre for several weeks, like a number of Sudanese artists. Others were students who came to display their works during feted events like the Daniel Pearl Day, which the Centre celebrated with the American Embassy to remember the fallen journalist who died in Karachi, Pakistan. Either way, it meant that in many instances, the artists’ styles as well as their skills were still incipient, in the process of becoming. In other cases, artists came through Paa ya Paa already having a keen sense of aesthetic direction and determination to become professional painters as quickly as possible. One such artist is a young Sudanese artist named Abusharia Ahmed. Now a painter whose works are exhibited all over the world and sell for hundreds of thousands of shillings, Phillda has vivid memories of the young man. “He came to us carrying gunny sacks and stayed in one of the rooms we had built for visiting artists like him,” she recalls. “He started selling his works for maybe KSh15,000. But gradually, we began getting visitors from various embassies who were specifically coming to see his art. Now he’s told me his smallest painting can’t sell for less than 100,000,” she says. Abusharia’s painting may be the most valuable piece in the auction. But there are others by artists who are now well known in the Nairobi art world. They include painters like Yassir Ali, Joseph ‘Weche’ Waweru, Allan Githuka, Evans Maina Ngure, Salah Ammar, Caroline Mbirua, Nuru Bahati, Eric Manya, Esther Mukuhi, George Ngaruya and Lionel Njuguna. Even the graffiti artist, Uhuru Brown has paintings in the PYP gallery. 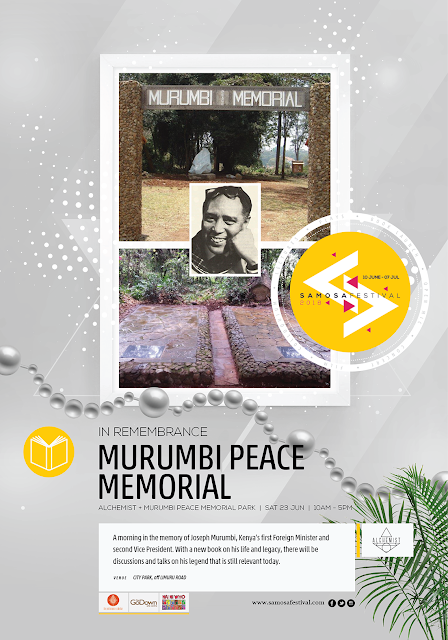 So does the former Principal at Buru Buru Institute of Fine Art, Rix Butama. So there are any number of gems to be had. There are also works by a whole range of less known artists, such as Adam Massava, B. Chege, the late Florian Lloyd, Imma Juma, Allan Green, Eliud Ngugi and Ethiopian artist Michael Yejisaw. 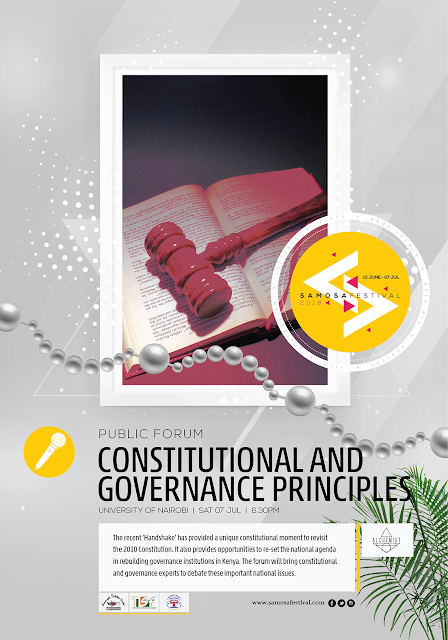 There are also pieces by Lawy Opiyo, Ezra Joab, Patrick Kariuki, B. Wangotho and J.K. Hassan. There is even one beaded work by Kibachi Gatu which is stretched out on goat skin that’s attached by leather laces to a frame made out of spear-like poles. Meanwhile, several shows opened this past week. At the Attic Art Space, an exhibition by Meshack Oiro, Leevans Linyererea and Wallace Juma opened last weekend. It will remain open until end of month, but it’s best to see on weekends. Then last Tuesday, Wallace Juma’s ‘Dumpster Series’ entitled Reflections opened at Alliance Francaise. And tomorrow at Polka dot Gallery, Anne Mwiti has an exhibition opening. 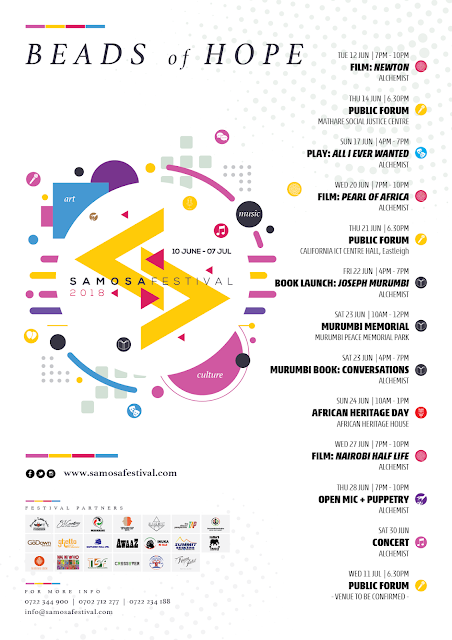 The 8th Samosa Festival opens this coming Sunday afternoon (4pm) at the Alchemist in Westlands. 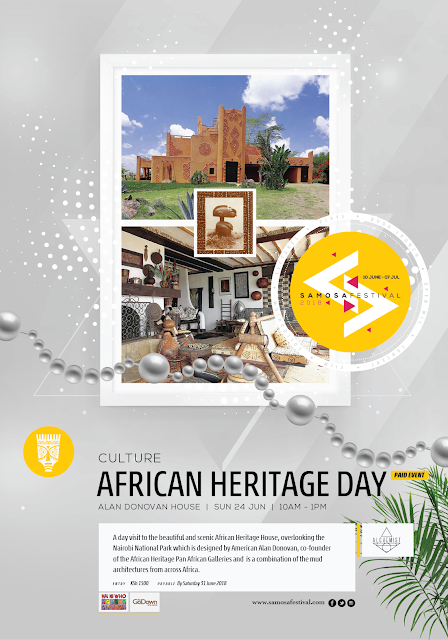 There will be a tasty preview that day of all the fascinating multicultural events that will transpire between 10 June and 17 July. 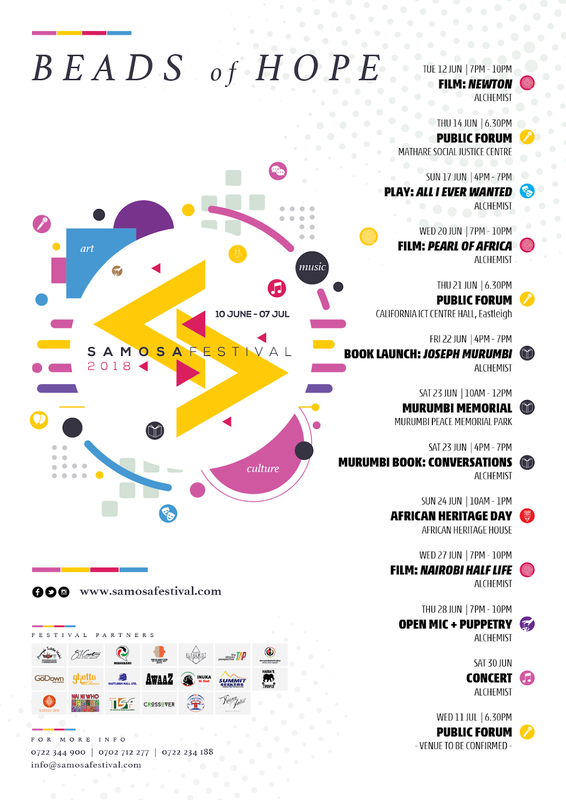 This year’s Samosa Festival will be filled with films, public forums, puppetry and an original Kenyan play by Walter Sitati and Hearts of Art entitled ‘What Can’t Kill You’. There will also be an Open Mic where local poets will perform as well as a book launch accompanied by stimulating discussions with the author of the new book about Kenya’s first Foreign Minister and second Vice President, Joseph Murumbi, the former Kenya media ombudsman Karen Rothmyer. There will even be a house tour of the African Heritage House, a site filled with heaps of Pan African art, artifacts, musical instruments, textiles and architecture from all over Africa. The public fora are events one won’t want to miss, apart from one happening 21 June, which is said to be ‘for women only’ since it’s about Gender-Based Violence and the Persistence of FGM. 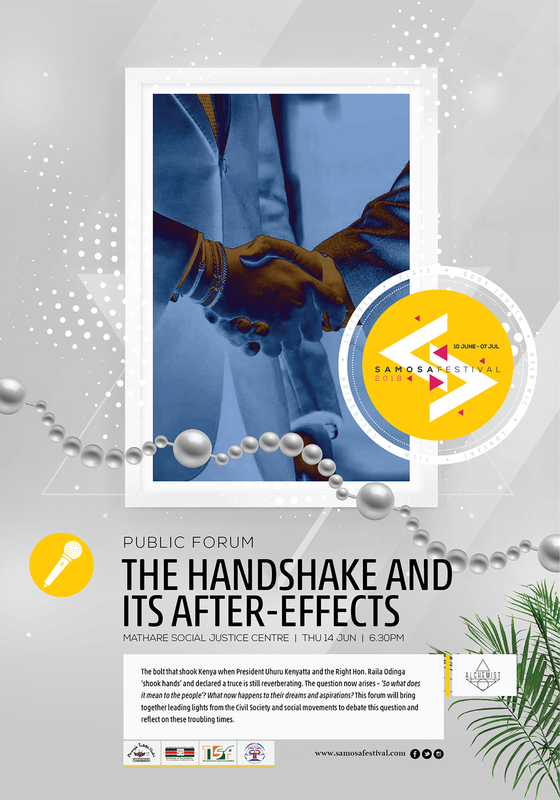 But the others are bound to rouse lively discussions as they will address such topics as the ‘Handshake and its After Effects’, upcoming on Thursday 14 June at the Mathare Social Justice Centre and ‘Constitutional and Governance Principles’ happening Saturday, 7 July from 6:30pm at University of Nairobi. The films should also attract crowds. At The Alchemist, ‘Nairobi Half Life’ will be shown on Wednesday 27 June and Wednesday, 20 June, the documentary ‘Pearl of Africa’ about a Ugandan transgender person will be screened. Joy Mboya, Managing Director of The GoDown Art Centre will be keynote speaker at the Sunday Launch. The organizers of the Festival Zahid Rajan and Zarina Patel will also be there with their team. The rains came just in time for Geraldine Robarts’ gardens. They drank in the rain like thirsty children. Fortunately, it didn’t rain on the weekend that she had her ‘Art and Soul’ exhibition at her home in Karen. But they had come in time for all the art-loving visitors who arrived at the veteran artist’s Kibo Lane house in Karen to feel refreshed by the ultra-green ‘paradise’ that the rains had revived. “We had lots of children painting out in the garden during the exhibition and they loved being out there,” says the former art lecturer who’d taught both at Makerere in Uganda and at Kenyatta University as well. Geraldine recalls that when she first moved into Kibo Lane in the late 1980s, there were no gardens. “The place was a dust bowl,” she says bluntly. “The previous owner had been a horse trainer who also loved racing horses, so she had little time to look after the land,” she says suggesting that the horses had trampled the land without anyone giving the grounds much attention. “There was rubbish everywhere and just one or two sorry old lemon trees, but that was it. I had to start from scratch,” says the lady who now finds loads of inspiration from the garden grounds that she planted herself. Geraldine had been happy that at least there were lemon trees. But since then, she has planted a myriad of fruit trees. Back in the Eighties when her family bought the place from the lady horse trainer, they were able to obtain quite a substantial acreage. “But then came the children’s school fees and so we sold the land, acre by acre,” she says. But looking out on Geraldine’s garden from her house, one can see that she also a big fan of beautiful flowers. Not that she has much time to look after them now, since she literally paints around the clock. “Just because the exhibition is over hasn’t meant I intend to stop painting,” she says, speaking as if the idea of stopping was anathema, inconceivable to her. But she admits that her gardens are a great comfort to her. More importantly, they are a tremendous source of inspiration as one can see from the look of so many of her paintings. Inevitably, flowers find their way into the vast majority of her paintings. “Every day since the exhibition, I have been out in my garden painting,” she says, aware that working outside amidst the greenery and the rainbow array of flowers has to feel like paradise. The one person Geraldine counts on to keep up the gardens is her husband Mike. He’s a lifelong gardener and an Englishman who is happy to look after the flowers as well as the fruit trees and all the other green things growing in their yard. He even looks after the green house which one might not even notice as one passes by upon entering their extended driveway. Perspective is everything. From one point of view, the city of Nairobi is filled with garbage. From another, including mine, Nairobi is filled with fine art. It’s there in abundance. And the proof is all the new places as well as the older more established ones that interested folk can find it in, especially on weekends. The newest space that’s putting contemporary Kenyan art on display are the Tamarind Tree Hotel, a funky new place situated just next door to the Carnivore and literally filled with photography, colorful murals and a spacious art gallery (that doubles as a conference hall, in a way that’s comparable to what they do at the Dusit D2 Hotel, another venue that holds exhibitions of up-and-coming Kenyan artists on the last Saturday of every month). The group show was put together by Polka Dot Gallery and the free-lance curator Humphrey Mugo. The two brought together 20 local artists including everyone from junk artist Joan Otieno, Coster Ojwang, Wycliffe Opondo, Nadia Wamunyu and David Maina to Alex Wainaina, Nelson Ijakaa and Patrick Kinuthia among others. The exhibition was eclectic but enchanting in its diversity. The other brand new exhibition space is at Muthaiga Heights where Beta-Arts and Gloria Barasa are now showing more young rising stars in the local art scene in Pop-Up exhibitions. Last weekend, Gloria with assistance from Emmaus Kimani of Brush tu Art Studio curated an outdoor exhibition on the balcony of the new flats. Artists featured included Abdul Kipruto, Evilidah Wasai, Leevans Linyerera, Munene Kariuki, Saad Lukwago and Wallace Juma. Both Gloria and Emmaus have jumped into the art scene after having heard from many young artists that they need venues in which to share and potentially sell their art. So we’ll be seeing more of Beta Arts collections in days to come. The other relatively new art space, which has an opening tomorrow, is The Attic in Nyari. Kuona sculptor Meshak Oiro will be exhibiting along with two artists whose works Gloria just showed, namely Wallace Juma (who won First Prize at this year’s Manjano art competition) and Leevans Linyerera. One hopes we won’t see the same works at the Attic as we did at Beta Arts. One artist who doesn’t recycle his art is Timothy Brooke who’s been so industrious in the past few months that his art, including his new oil paintings, water colors and drawings fills all the walls at One Off Gallery. That’s a feat in itself since One Off just expanded into a new space (Carol Lees’ former stable) that is even bigger than its original Loft. Timothy runs wild, painting herds of zebra, wildebeests and wild buffalo, all of whom are on the move themselves. Their dynamism is captured in his art as his paints and pen both easily capture their flight across the savannah. Meanwhile, Timothy Brooke is not the only vintage artist currently exhibiting in Nairobi. At Nairobi National Museum, Ngecha artists who gained renown in the 1990s have re-emerged in an exhibition curated by King Dodge King’oroti of Ngecha Art Centre. That means one can see new and older works by artists like Chain Muhandi, Wanyu Brush, Sebastian Kiarie, George Ngaruiya, Martin Muhoro, Daniel Kinyanjui, and Dodge himself, among others. It’s a show that will make one nostalgic for past initiatives of Kenyan artists who hold an important place in the history of contemporary Kenyan art. Finally, the best evidence to show how Nairobi has become a hub of artistic activity is the fact that artists from other parts of East Africa art flocking here to have exhibitions. In the past few months we’ve seen Ugandan artists exhibiting at Village Market with works that have set a standard for up and coming artists to learn something from. Then too, Tanzanian artists have also come to Kenya this month and over a dozen of them are exhibiting as from last Saturday at Banana Hill Art Centre. Last but not least, the Maasai Mbili artists workshop at Polka Dot Gallery went well last weekend as James Dundi Obat shared his skill stitching metal in a way we haven’t seen since it used to be done by another Kenyan, Kota Otieno.